I am taking these pills called “gu-yu de-pak” that are supposed to cure my “drangwa.” My problem is, I don’t know what these pills are, I don’t even know when exactly I am supposed to take them, and I don’t really know what this “drangwa” is that the pills are supposed to cure. Welcome to Tibetan medicine land. Now I am a fan. 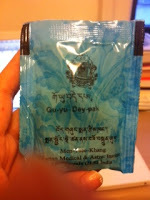 I think the Tibetan medical system is pretty freaking awesome. I like the idea that Tibetan medicine is focused on curing the patient and not just the illness. I think it’s amazing the way the doctors use their own bodies as a fine-tuned diagnostic instrument. I get a thrill every time I get my pulse checked (with their fingertips held tightly against my inner wrist—I am easily thrilled) although getting my pulse racing just then is not exactly guaranteed to give the best reading. And I like the way Tibetan pills are not supposed to have any side effects, although sometimes they don’t seem to have any main effects either. I just think, ok so there was Yuthok Yonten Gonpo who wrote the Gyuzhi, the four treatises of medicine, in the, wait for it, 12th century and that is still the main text of Men-tsee-khang students today? Sure, that speaks to the excellence and vision of Yonten Gonpo’s work but doesn’t that also mean that in all that time no one else wrote anything better? And this was a system that knew how to detoxify mercury. Come on, people. You can do better. Anyway, so the point is Tibetan medicine is pretty sophisticated, and especially good with chronic illnesses, and when we heard that an Amchi was coming to New York, my brother and I both went. The Amchi has a very good reputation, and he’s a “lamen”, physician to His Holiness. Although I have noticed that a lot of people seem to be His Holiness’s physician. If someone stays long enough at Men-tsee-khang, do they eventually get bumped up to the team of His Holiness’s physicians? That would be ridiculous right? This gig shouldn’t be an equal opportunity thing. It should be the best people, and not just the people who stuck around long enough. Not that I think it’s that. I am sure it’s not. Really. Ok. So anyway, I was feeling in pretty good shape. Alright so my exercise consists of climbing up four flights of stairs to our apartment, but I don’t drink, do drugs or eat lard. On the other hand, I eat tons of Nongshim noodles (only circumstantial link between msg and cancer, you know, or so I tell myself) and didn’t really drink water for the first fourteen years of life. Overall, I feel generally fine. But my brother has a persistent sinus problem that’s been bugging him for the past, oh so many, years. And recently, in my sisterly fashion of taking up whatever bad habit he has and taking twice as long to get rid of it, my nose and throat had been clogging up too. « China wanting to understand Tibetan self-immolation?